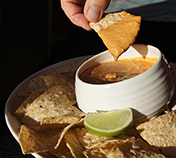 This all-natural Queso Dip is easy to prepare, packed with flavor and a great low-fat alternative if made with an all-natural low-fat cream cheese. All you need is a microwave oven, Larry’s All Natural Taco & Enchilada Chipotle or Ranchero Sauce, whipped cream cheese and your favorite chips. 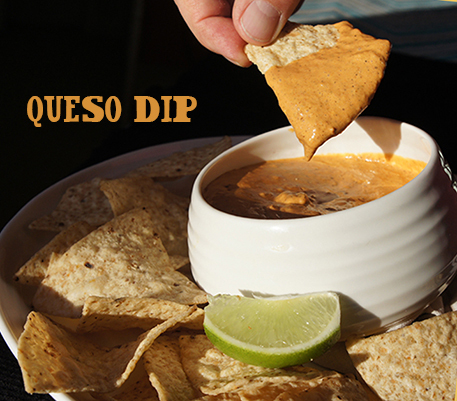 Pour a 16 oz jar of Larry's Chipotle or Ranchero Sauce it a microwave-safe bowl. Add 8 oz of whipped cream cheese. Microwave for one minute, stir to blend well and microwave for another minute or until hot, careful not to overcook. Serve with chips and lime wedges. Reheat if the dip cools down.